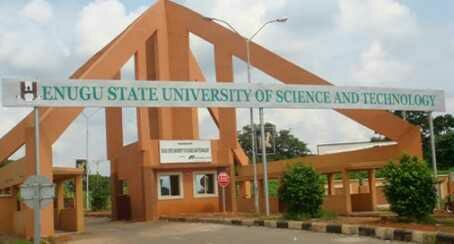 Anxiety in Enugu as ESUT loses accreditation - BlogIT with OLIVIA!!! Anxiety has gripped students of the Enugu State University of Science and Technology, ESUT,over alleged loss of accreditation of several departments following its alleged disengagement of about 153 of its lecturers. ESUT management tagged the recruitment of the 153 lecturers as an,”academic fraud,” even as the affected university lecturers had lamented that they were sacked by ESUT authorities shortly after using them to scale the last accreditation exercise of some of its faculties/departments. Despite several protest letters and appeals, the University refused to rescind their sack. Confirming the withdrawal of the accreditation of faculties/departments earlier given to ESUT authorities,Tuesday, the Director of Information and Public Relations of the NUC, Mallam Ibrahim Yakassai, said that the NUC under the Executive Secretary, Professor Julius Okojie frowned at a situation where some universities hired and sacked lecturers immediately after using them (lecturers) to get accreditation. Malam Yakassai acknowledged that the Commission received several petitions from the dismissed lecturers from the Enugu State University of Science and Technology. In a Save Our Souls letter sent to the NUC through their lawyer, B. N Ugwu, the affected lecturers had alleged: “Sometime in May, 2015, the authorities of ESUT under the headship of Professor Cyprian Onyeji advertised and offered employment to about 153 eligible applicants who scaled through in the pre-employment interviews and screening to different departments and faculties of the university. “Since our employment in May, 2015, none of us had been paid salaries notwithstanding that we played our roles in teaching, setting examinations, invigilating, marking papers, supervision of projects and submission of result. They further stated that the authorities of ESUT immediately after serving them with the purported letter of disengagement from service, back-dated it to October, 2015, before moving to advertise for their replacement. “We cry wolf and shudder at this level of intimidation, indiscriminate and unlawful sack /disengagement aimed at short-changing our dreams and aspirations. We are law abiding citizens of Nigerians. renew their respective department accreditation based on the purported new lecturers that the institution is plotting to recruit at our detriment. legacy, more importantly as the government frowns against corruption, un-patriotism, and their likes”, they noted. When contacted, the ESUT Director of Communication, Ossy Ugwuoti, said he was not competent to comment on the matter until he gets clearance from his principal.